Ellvena is a Non-Executive Chairman and Director working across a number of different sectors in UK & Ireland. 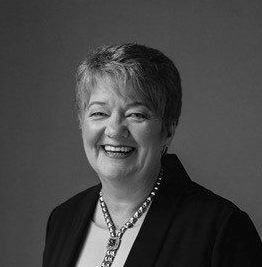 She has over 30 years experience in Banking, most recently at Executive Management level within Ulster Bank, where she was the Head of Ulster Bank in Northern Ireland & Managing Director of SME Banking across the island of Ireland. Ellvena has global experience within the wider RBS Group, having managed large scale Operations in EMEA for Royal Bank of Scotland. Ellvena embarked on a portfolio career in 2015 and holds a number of private and public sector roles. She is Chairman of the Electricity Supply Board (ESB), one of the major state-owned utilities in Ireland, with generation assets in NI, Great Britain & Ireland. Ellvena is also Chairman of the Belfast Waterfront & Ulster Hall (Conference & entertainment venues), is President of the NI Chamber of Commerce & Industry and Chairman of the Economic Advisory Group (EAG) in Northern Ireland. She is a member of the Senate (governing body) of Queen’s University Belfast and a member of the Prince’s Trust Council in NI. Ellvena has held a number of non-executive director positions, including as Chair of Board Audit & Risk committees and Remuneration committees. She was awarded the OBE in the 2018 New Year Honour’s List, for Contribution to the Economy and the Advancement of Women in Business. She was previously a Board member of Barretstown, a charity helping children with serious illnesses, up until June 2012, and a member of the Advisory Board of Women’s Executive Network (WXN) in Ireland until 2016.